A pioneering engineer gives back by funding scholarships that help international students fulfil their promise. Great things often get off the ground with the smallest investments. In 1957, the Government of Canada handed a Hungarian refugee a five-dollar bill as a stipend to begin a new life in a new country. Sixty years later, that same refugee would return the gesture with a gift worth more than 200,000 times that initial amount. In October 1956, student protests in Budapest ignited the Hungarian Revolution, a 19-day revolt against the country’s Communist regime that in turn prompted a brutal crackdown. As Soviet tanks rolled through the streets, Judith Schurek (BASc 1958), a mechanical engineering student just one year shy of completing her degree in her home country, escaped with her fiancé, Robert, to the safety of neighbouring Austria. There, they learned of an opportunity that would change their lives—a scholarship at the University of Toronto in faraway Canada. Arriving in Canada in 1957, the Schureks were each given a five-dollar bill, the equivalent of just under $50 today. To make ends meet before classes resumed in the fall, Schurek took a job at the Bell Telephone Company of Canada, and eventually obtained her degree in 1958 as one of the first female mechanical engineering graduates in U of T history. After graduation, Schurek returned to Bell as a telecommunications engineer, forging a successful 38-year career there before retiring in 1996 to found Environmental Allies, an engineering consulting firm. 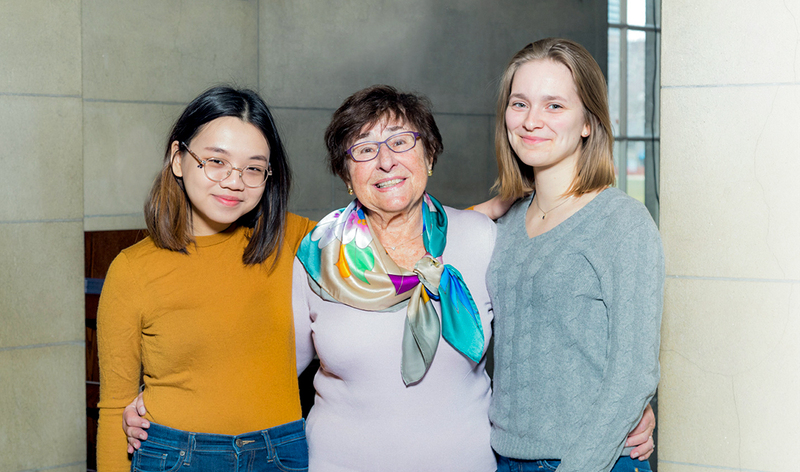 More than 60 years have passed since that fateful day in Vienna when Judith Schurek and the University of Toronto crossed paths, but she has not forgotten. In 2018, she created two Lester B. Pearson Scholarships—one in her name and one in memory of her late husband—with a generous gift of more than $1 million. Awarded annually, the Lester B. Pearson International Scholarship Program is U of T’s most prestigious and competitive scholarship for international students. Scholars demonstrate exceptional academic achievement and creativity and are recognized as leaders within their school. Each year approximately 37 students will be named Pearson Scholars. Schurek’s gift created scholarships that help two international students each year continue their studies at U of T. The first recipient of the Judith Schurek Pearson Scholarship is Katharina Vrolijk from Switzerland who is studying architecture and design at the John H. Daniels Faculty of Architecture, Landscape, and Design. Katie Kwang is the inaugural Robert Schurek Pearson Scholar. She is a student from St. Joseph’s Institution International School in Singapore who is working towards a specialist degree in psychology.